The iPhone 6 and 6 Plus had their fair share of torture scenarios when introduced, as they were dropped and efforts to bend them were made quite often in the first few weeks after release. Now that the dust has settled over Apple's newest handset models, it's time for more refined interrogation techniques. How about boiling the iPhone 6 in Coke? We bet you never thought of that, but this is why the world now is one big global village, as one human on the other end had this idea instead of you, and took to YouTube to tell the tale. Needless to say, the iPhone 6 stopped working after being boiled in hot, simmering Coke for a while, but we are more interested in what happens with the heated beverage afterwards - does it cure all illnesses after being boiled silly? That's how big inventions are made, folks. I admit i hate the iPhone but this is taking it to a whole new level! None of these look great after boiling, soda's look like caramel or somesuch, the beer looks like...I don't know what. About which is 'better' for you, I believe that 'too much' of either is bad for you, which is best out of that? hell if I know. Beer actually has all 13 mineral your body need which in my eyes that's pretty good. I only drink like 2 beers a week lol I stick with water all the time. But the SONY Z3 can survie while cooking in a hot pot stew. Another wasted 900$ phone. so sad. I'm surprise it didn't EXPLODE while cooking. He is know for torturing phones in the youtube community, its sort of his thing to get views and ad revenue. Before all you clueless keyboard warriors start saying why he wasted so much money etc. With ads revenue and his own sponsors he already made the money he spent on the phone + god knows how much profit. Don't watch this stuff, cut off funding from advertisers. What did I learn from this video? This video makes me wish that the smoke off exploding batteries was more toxic. Some Darwinism needs to take care of this idiot. I thought a ghoulish hell hand would reach out of that pure liquid evilness. Was it just a dummy phone? 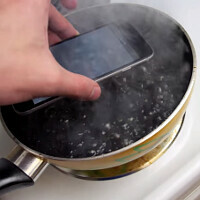 I remembered the iphone on liquid nitrogen and then they smashed it. I can see ifans with their saliva dripping. Are we running out of material? This is ridiculous! "Watch me pour sulfuric acid on my Blackberry" Mindless story. I think I'll fart on my Lumia 920, just to see what happens to it.